Flying across different time zones disrupts our biological clocks and our circadian rhythms, leading to jet-lag. It is generally accepted that it is harder to fly West than East. When you fly West, your destination time zone reaches night time when your departure time zone is still in the day time. When you fly East, you just have to try to stay awake for a bit longer. I can vouch that it’s far easier to stay awake for a few more hours than to make yourself go to sleep when you are just not tired. A rule of thumb is to allow a day of jet lag for every time zone you cross. Sydney is currently 11 hours ahead of the UK and this means my mum might be jet-lagged for a whole week and a half before she adjusts to Sydney time. That’s pretty significant for a four week trip. There are many people who claim they have a way to beat jet-lag, but are they scientifically justified? The key is to understanding how our biological clocks work and how they can be re-set. Our biological clocks are largely controlled by a section of the brain called the suprachiasmatic nucleus (SCN), located in the hypothalamus, a part of the brain just above where our optic nerves cross. 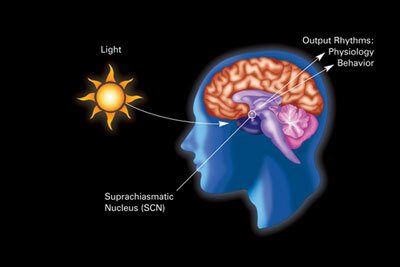 Light (unsurprisingly) is the main stimulus to which our SCN responds. When light levels are low, our SCN produces neurotransmitters, in particular ones which tell the pineal gland to produce a hormone called melatonin. High melatonin levels make us feel drowsy – although it doesn’t have the same effect on nocturnal animals, who also have high melatonin levels at night! That’s the simple summary. There’s loads more information about our circadian clocks here on How Sleep Works. In some countries (not all) you can buy melatonin over the counter. Since melatonin is the main chemical involved in this system, many people swear by taking melatonin to make them counter the jet-lag. Some studies have also shown that taking melatonin supplements at your destination, at a time close to the desired bedtime, can help to reduce jet-lag. I am very wary of this approach. Why? It seems to make sense – after all, if you are not sleepy because your body hasn’t produced enough melatonin, why not take some tablets and make yourself sleep? In general, our bodies are not as simple as we think. If a car engine is low on petrol we can just fill it up and it will run smoothly again. Our bodies are not cars. We can’t expect to ‘top up’ our bodies with a particular hormone and for it to just affect one system. 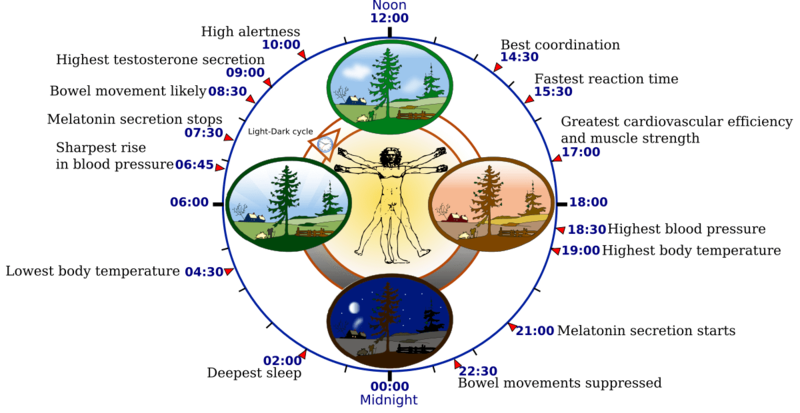 Circadian rhythms are not just about melatonin, and even melatonin is not as simple as people would like to think. Melatonin is produced in other organs including the gut and the bones. A precursor to melatonin is the neurotransmitter serotonin – yes, the one that is linked to depression. Receptors absorbing serotonin are targeted with a particular type of anti-depressive drug called SSRIs or Selective Serotonin Reuptake Inhibitors. The success (or not) of these antidepressants makes me suspect that our response to serotonin and perhaps melatonin is highly individual. Melatonin is also linked to the timing of female menstruation and, in males, can interfere with sperm count. Melatonin can interact with drugs like warfarin, and its safety in pregnancy and lactation has not been studied (to my knowledge). The contraindications listed seem to vary from country to country, but high or low blood pressure, diabetes, depression and epilepsy are among those listed. Known side-effects are nausea, dizziness, headache, enuresis and an increased risk of seizures in those with neurological disorders. I said earlier that some studies showed taking melatonin before bedtime can increase the amount of sleep. One study concluded it had no more effect than a placebo. In the positive studies, am not sure that the quality of sleep was measured, and whether people cycled through the same phases of sleep that they would do in a normal night. Anecdotally, I have heard that taking melatonin may help you to sleep but you wake up not feeling rested. More rigorously, in 2002 a meta-analysis of nine studies on melatonin, showed that the overall effect was only to increase the sleep duration by 13 minutes. I personally believe this is not enough when you have travelled across ten time zones. On top of all this, there is no agreement about how much melatonin you should take to ‘treat’ jet-lag or insomnia, and many tablets sold as herbal supplements contain melatonin in far higher amounts than your body would produce naturally. For example, a very quick web search revealed this product which contains 10 mg melatonin per tablet. The amounts I have seen recommended for jet-lag range from 0.5 mg to 5 mg. Some advice says to start with very small amounts, i.e. 0.1 mg, and increasing each day until you find a dose that works. I hope it is clear that personally I do not recommend melatonin at all. For more information, see this article on PassportHealthUSA.com, this one from the University of Maryland Medical Center and this one taken from the Gale Encyclopedia of Alternative Medicine. If subjecting our body to large amounts of melatonin is too heavy handed, why not go a few steps back along the process and change our exposure to light? Bright lights of the right wavelength will trick our body into thinking it is daylight (thus stopping production of melatonin) and blocking out light will make our body start to produce melatonin. The key wavelength of light that prevents melatonin production appears to be in the blue part of the spectrum, hence why people are recommended to turn off their computers and TV screens for at least an hour before they want to sleep, or at least view the screens through filters such as rose or orange glasses. I was interested to read about an app called Entrain, produced by researchers at the University of Michigan, which purports to tell you exactly when to expose yourself to light, or block out the light, and for how long, in order to cut down on your jet lag. You don’t even have to go to bed or sleep during the dark patches; instead you can use special glasses or a visor to block out the blue wavelengths. According to the researchers, quoted in an article in Scientific American, using the app correctly means it will only take four days to adjust to a 12 hour timeshift. Sadly, the app seems to have been very badly designed and has quite a few bad reviews. Maybe someone who develops apps should offer to partner with the lab to produce something with more commercial viability? There have been studies on mice (yes, not on humans) showing that you can change a circadian rhythm based on the size and timing of a large meal each day. Extrapolating to humans (yes, which is dangerous) would imply that the best way to re-set our biological clocks is that in addition to light exposure in the morning is to have a big breakfast in the morning. I have further read that the longer the fasting period, the better the re-set. Some people have gone so far as to say that you can avoid jet lag altogether just by fasting for 12-16 hours and eating a huge breakfast when you are at the destination at breakfast time. My mum is very sensitive to timing of meals and I suspect she is at least pre-diabetic (although she will probably deny this). The flights alone will take her 27+ hours, and there is train travel to London on top of that. Other people who can better cope with fasting for a long period might want to try this out and comment below! One time when I travelled on a long-distance flight I found a trademarked approach to jet-lag that involved prescribing what kind of food to eat and when, for quite a long time period both leading up to the flight, during the flight and after the flight. I wasn’t convinced enough to pay for my customised meal plan. I do, however, feel there is enough basis to try eating protein in the morning and carbs in the evening and seeing if that helps with the jet lag. It might also be worth setting up this routine before travel, so that the type of food eaten is associated with the time of day. I spent so much time researching these three aspects of avoiding or dealing with jet lag, that I haven’t even touched on use of stimulants and exercise. But read my next blog post for my recommendations. This entry was posted in Uncategorized and tagged food, international flights, jet lag, light, long haul, melatonin, travelling to Australia. Bookmark the permalink.